Source-Connect Now the Future of ISDN for Voiceover Actors? Source-Connect Now, the ISDN Alternative, is free for everyone. Everyone is asking about pricing. Source-Connect Now will be offered as a tiered service including a professionally-usable free account providing high-quality audio (128 kbps, Opus codec). All accounts will be able to connect two people at broadcast-quality 128kbps – for free. For premium features, pricing will start out as low as $8 a month, with a middle tier around $24 a month. There is no need to purchase additional links: Guest accounts are always free. Source-Connect Now is the most affordable and flexible IP Audio system available. At this time Source-Connect Now are working on final Beta finishing touches and adding premium features – while we perfect these features all accounts will have access to everything for free. Towards the end of the year, Source-Connect Now will charge a nominal fee for premium features while continuing to provide a free service capable of 128 kbps audio quality: because Source-Connect Now believe that in the 21st century, high definition audio over the internet should be freely available to everyone… and because we all never want to hear a phone-quality interview on the radio or podcasts again! 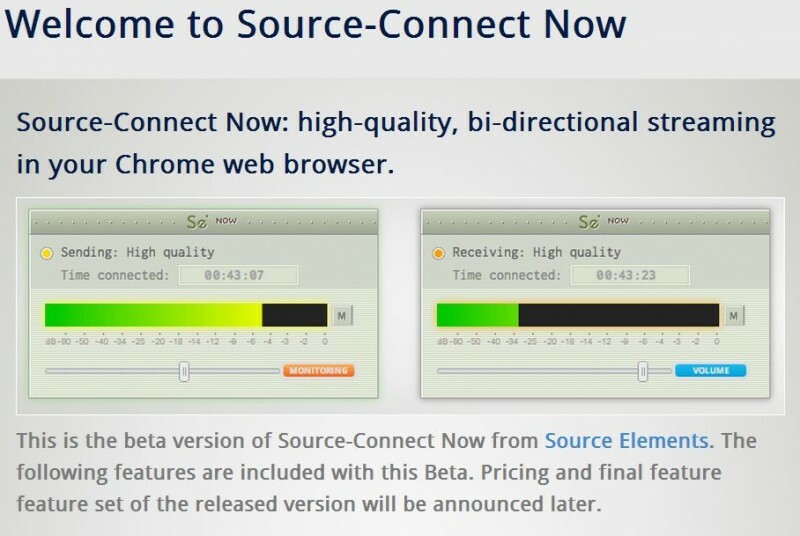 To summarize: Source-Connect Now is and will be free, and soon will also have premium features offered as part of a subscription service.